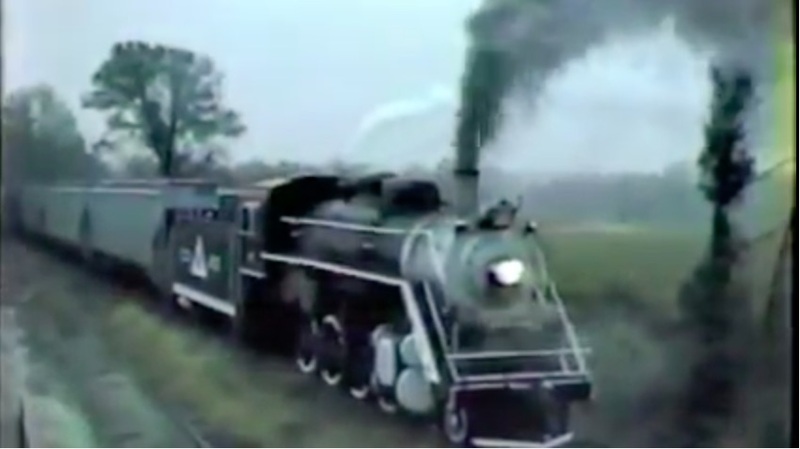 Awesome Story (and video) – The Tourist Line That Accidentally Became The Last Steam Railroad In America – Operated Until 1986! (By Greg Rourke) – We recently showed you a steel mill that used steam locomotives to shuttle cars around until 1980. Some claim this was the last use of steam in revenue service. Those folks are incorrect, and are unaware of the Crab Orchard and Egyptian Railway who used steam powered freight trains until 1986. Way down in Southern Illinois are the towns of Herrin and Marion. They had some railroad tracks that were seldom used, so a couple of enterprising guys decided a tourist railroad would be a good idea. In 1971 they bought a little 2-4-2 steamer and a couple passenger cars and hung out their shingle. Business was pretty good, they decided a bigger loco was in order. They found one in Connecticut in 1975, but by the time they got it on the property it was 1977. As it was inoperable, a major rehab began right away. Also in 1977, disaster struck when the building housing the railroads offices and some of its rolling stock burned to the ground. Then a few months later, the Illinois Central Gulf decided freight service on the few miles the Crab Orchard was sharing wasn’t profitable and they offered them a deal they couldn’t refuse. So while some of their passenger cars burned, they were now in the freight business, still with steam. Tourist service was discontinued. By 1979 their larger 2-8-0 locomotive was ready to roll and the smaller unit was retired. They became the only steam railroad to operate intermodal trains when they ordered a bunch of piggyback cars and trailers. No doubt a consideration for continuing with steam was the fact that this is coal country, so they had a source of cheap fuel. They were kept busy hauling oil, lumber, machinery, coal, ammunition, and Maytag appliances. They were profitable where the big railroad wasn’t, fairly common with shortline operators. All was going well until 1986 when they had a failure of the big steamer. As a major federally mandated overhaul was coming up anyway, plans for dieselization were in the works. Number 17 was retired, and was sent to Iowa for static display. The little railroad with less than two dozen miles of track is still chugging along, albeit with diesel power. And they get to claim they are the last users of steam power in freight service, a record not likely to be broken. I went searching for more about this railroad, and found there’s another interesting case of luck intervening to keep them operation. The diesel locomotives arrived a mere four days before the 2-8-0 steamer broke down. Overall, the story seems to be one of those cases where nobody stopped to ask, “Is this idea crazy?”, or at least managed to find a good answer as to how it really wasn’t. um, we regularly use steam in revenue freight service, to this day.